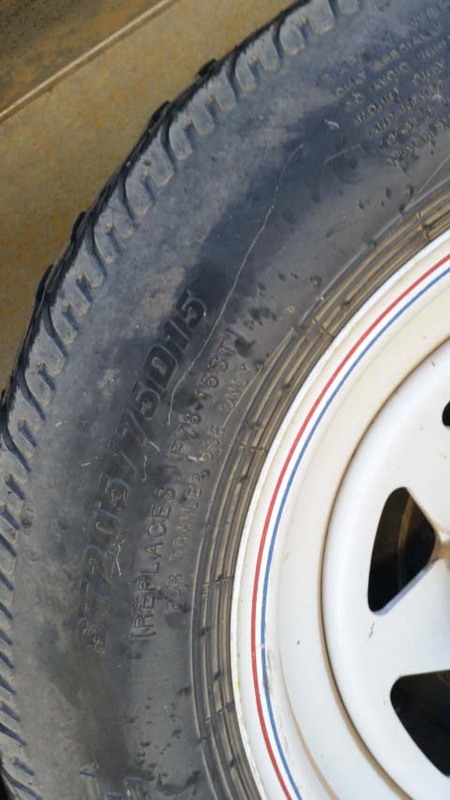 Ok so all 4 tires on my travel trailer are showing severe cupping wear. The tires themselves are probably 5-6 years old but have maybe 1500 miles on them at most. When I first noticed wear I thought it was loose wheel bearings to I tightened them up a bit early last year. We just got back from camping a couple hours ago and several of the tires is now worn down so bad it will have to be replaced before our next outing. But, I am NOT going to put on another set of tires until I am confident we've isolated this issue, and fixed it. I cant afford to replace a full set of tires with so few of miles. I've heard balance can be cause this, but it still looks like loose bearings to me, or posssibly both? This cupping wear isn't even around the diameter of the tire, one side is much worse than 180 degrees around the tire. I yanked the tire, didnt feel any give in the bearings. But this shows a better angle of the extreme wear. I'm taking it in to a trailer shop and see what they say, I'm sure they've seen similar issues countless times. Anywho, here's some picts. Thoughts? I'll be waiting for the answer too. I had some problems with the tires on my kayak trailer and found that I had under-inflated them. The problem with that trailer is that it is so light that it wants to bounce. they look way over inflated to me...far too rounded they should be much more level. Ive seen it in truck tyres where the internal bands have let go causing tyre to bulge in parts of tread. look forward to seeing what tyre guys have to say. Elvis may very well have hit the nail squarely on the head. Also, as Elvis said, those tyres look to be running higher than acceptable pressure in them. I run 32 psi max in my trailer tyres, maybe 34 psi with upwards of 750kg loaded. From my experience, the "cupping effect" is generally caused by the trailer axle being slightly out of alignment...the wheels aren't running square to the towing vehicle. You are running radial tyres as well which may exacerbate the problem. I was always told to run cross ply tyres on my Coleman Campervan for this very reason. You could try checking the alignment yourself by taking measurements, but the trailer shop should be able to pick up any misalignment of the axle because it may only be millimetres or a few degrees out. However, it will be enough over time to cause abnormal tyre wear like you are experiencing...even more so with a load in the trailer. I've seen a similar thing happen to motorcycle front wheels when retro fitted with a single disc brake (strange as it may seem, it slows down one side of the tyre before the other resulting in this type of tyre wear). I agree...Check wheel alignment. Including alignment between both axles. Check your spring hangers for wear or damage. Make sure that the axles haven't shifted on the springs. They are set to 40lbs. Max range for the tire is 50. Maybe I'm running on the soft side which allows for too much deflection in the tire.. So a couple tire experts took a look at it and said without trying to be rude, we were running the cheapest trailer tire there is. They discounted alignment issues as those typically manifest as uniform feathering along the inner or outer edge depending on toe. 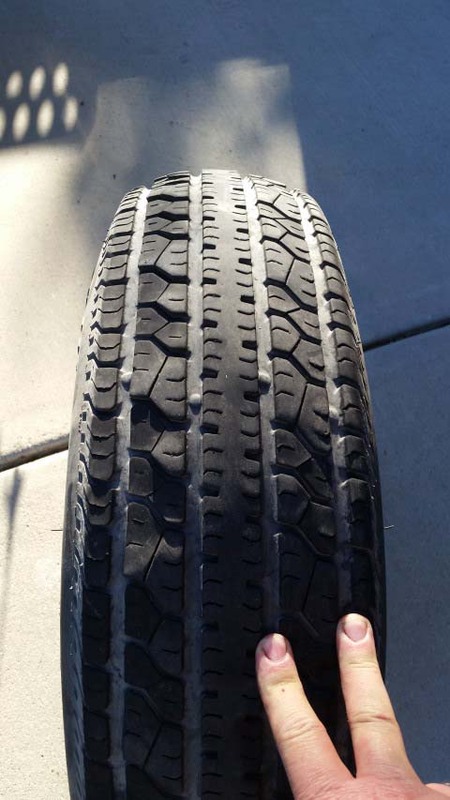 They said they've seen countless similar tires, and wear like this is very common on this type of Carlisle tire as the tire ages and begins to break down. He said it was a marginal tire for the trailer anyway and suggested stepping up to a heavier radial tire with more plys. Soooo as this set is shot anyway, I'm going to take their advice and step up to a heavier radial. I'll keep a very close eye on wear and the first sign of anything abnormal I'll get it into the shop. Dallan, looks like their advice is worth following. 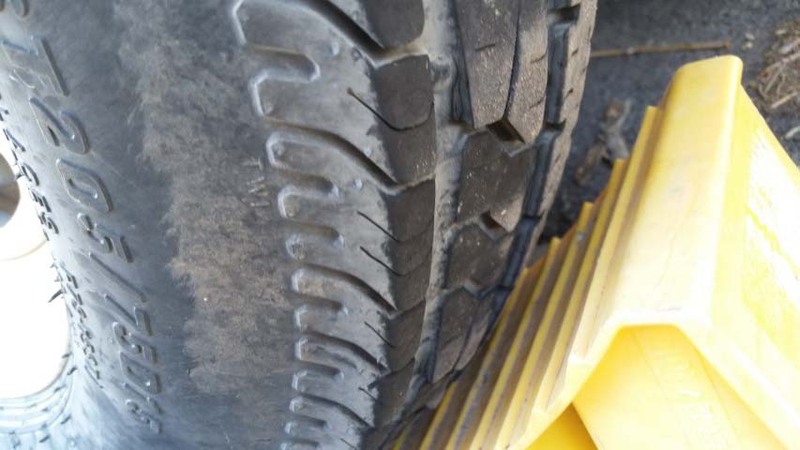 Cheap tires on trailers or vehicles leads to problems. I had a friend with a trailer that we took on a Boy Scout Outing. Every time he sustained over 70 mph in the dessert heat he blew a tire. Blew 3 (he had lots of spares). We had to stop in a little town and get one replace so we at least had one left. Suggested that he not go over 60 to see if we could get home without having to stop to change another tire. He slowed down and we made it home without another blown tire. If you going long distance, you can't afford cheap tires. Yea. Ironically I have this set because we blew two tires in 4 miles on a trip once. We limped into the nearest tire store (Discount) and got the only set of tires they had (Carlisle). Never gave cheap tyres a thought. Oh well, a maybe expensive fix, but things should last for years now. 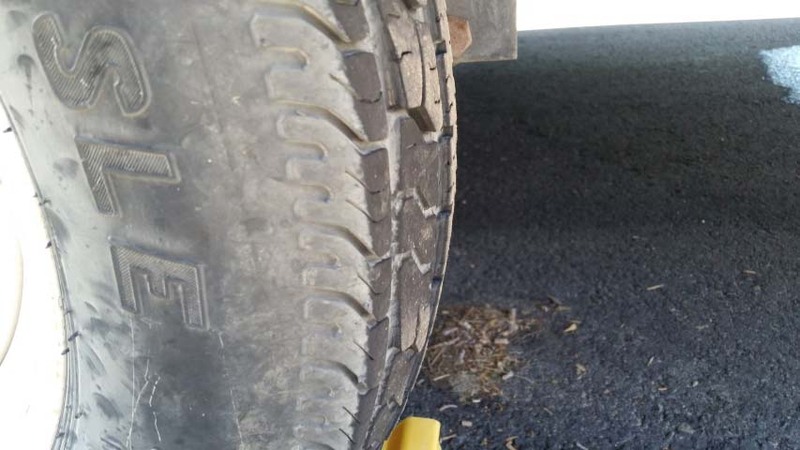 check out the local tyre guys as a set off a 4wd that are worn down and being replaced will be fine on trailer for ages yet...you dont need full 1/2-3/4" tread for a trailer only 1/4" sort of thing. we blew out a rear tyre on the terrano on Saturday same size as you running or plurry close to it. prices run from 160-400 each new but can pick up worn down 2nd hand set for $40 each so it might be worth a look for your trailer....ralley type tyres are even better as they have really strong sidewalls. Says the man with the economical alternative to new tires!?!? This guy must be the top tire salesman Down-under to get you to spend that much. At least you had enough change left over for a cold one to celebrate your purchase. ...This guy must be the top tire salesman Down-under to get you to spend that much. That's not a bad price for a 4WD tyre for this part of the world Slim...$$248.50 per tyre fitted and balanced. Everyday Bridgestone radials for my old 960 Volvo used to cost me $140 each. I'm dreading the day the Coopers on my XC60 wear out...I reckon it will be close to $300 each for them.